Kyteman will perform as a guest during Symphonica in Rosso in Arnhem in the Netherlands. The past two years the Dutch artist has had great success with his Kyteman's Hip-hop Orchestra, which has won several prizes, including the Pop Prize. Previously it was announced that bandoneon player Carel Kraayenhof will also perform as a guest as well as Sting's son Joe Sumner (Fiction Plane) who will sing a duet during this anniversary edition of Symphonica in Rosso on 15 and 16 October. Colin Benders, also known as Kyteman, has made an indelible impression with his Hip-hop Orchestra. The performances of this many-piece orchestra at Pinkpop, Lowlands, North Sea Jazz festival and Rock Werchter were hailed as an amazing experience by both the press and the public. It was not without reason that his album 'The Hermit Sessions' was awarded platinum for the sale of over 50,000 albums last summer. The Hip-hop Orchestra project rounded off its series of successful concerts with a sold-out show at the Heineken Music Hall last year. Since then, the Orchestra has only been performing outside the Netherlands. Kyteman is also an acclaimed solo artist. Earlier, his soulful mix of jazz and hip-hop also formed part of Krezip, Voicst, Relax and C-Mon & Kypski. Symphonica in Rosso is known as the most prestigious and quality music event of the Netherlands. At the first four editions of Symphonica In Rosso there were 675,000 visitors, spread over 21 Gelredome concerts, which were all sold out. The anniversary edition featuring Sting accompanied by the Royal Philharmonic Concert Orchestra, conducted by Steven Mercurio, is expected to be a high quality concert in one of the largest theaters of the Netherlands. In the warm atmosphere of Symphonica in Rosso, the visitors will be able to enjoy the greatest hits of Sting and The Police, re-imagined for symphonic arrangement. 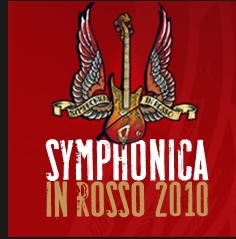 Tickets for Symphonica in Rosso are on sale via www.livenation.nl www.symphonicainrosso.nl and 0900-10102020 (€0,45 p.m.).